Bushiroad will release a Fate / Apocrypha Trial Deck+ and Booster set for its Weiss Schwarz Trading Card Game on October 12. 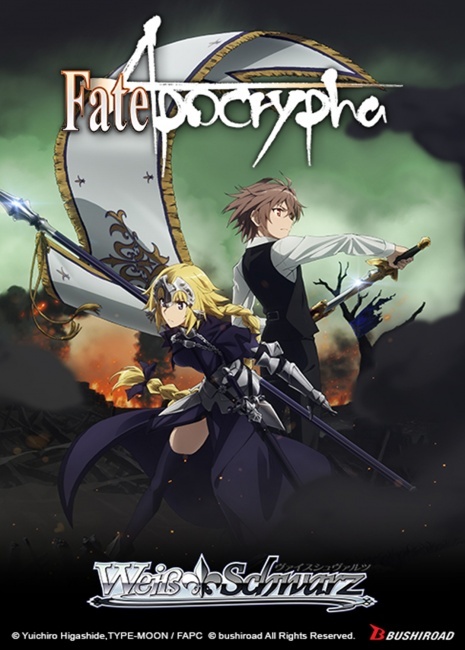 Based on the Fate / Apocrypha anime, Fate/Apocrypha is set in a parallel world to the Fate / stay universe. Two opposing factions, Red and Black, summon seven Servants, and the Grail summons its own Ruler-class Servant as a mediator for the Holy Grail War. Both sides are magic users, with Red members being mages, and the Black faction members from a Romanian magi group Yggdmillennia. The Trial Deck+ is a good introductory product for new players. It focuses on the first four episodes of the anime, and only includes two colors � red and blue. Each deck includes 50 cards (20 types of cards + 6 parallels), including 2 shiny cards. Each deck has a chance to include RRR (rare cards with special embossing) or a SP signed character card from Maaya Sakamoto from the anime cast. 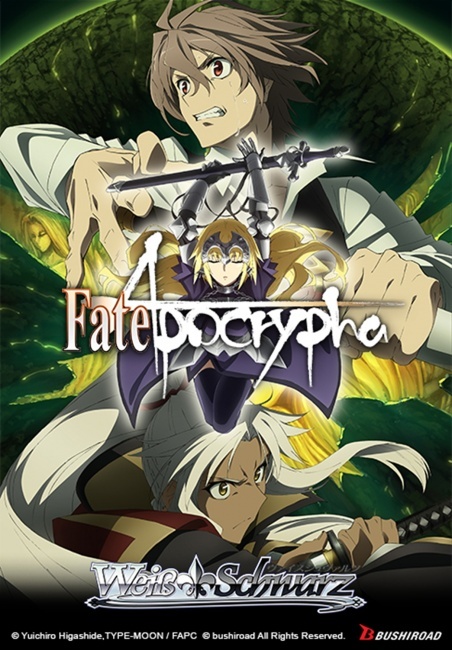 The Weiss Schwarz Booster Set Fate / Apocrypha allows players to play out the Great Holy Grail War with Masters� Command Spells and Servants� Noble Phantasms. The set includes 100 types of cards, including 22 types (parallel). Every pack has a chance to include a sign card from the voice cast from the anime. Each pack includes 8 cards. Each booster display includes 20 packs. Each carton includes 16 displays. 1 of 4 exclusive PR cards is included in every booster display. Each carton includes 4 English edition exclusive rubber playmats.